Honorary Life Members: Tom Barritt, David Shackleton, David J. Emmott, John B. Smith, J. Graham Hodgson, Bryan Tunney, John Pollard, Kim Pollard, Phillip N. Akrigg & Margaret Moorhouse. Sadly the club lost a number of its stalwarts this season. Firstly club president Tom Barritt sadly passed away on 13th April 2013 aged 88. Tom had been club president since 1998, having previously been both treasurer (1950-1957) & chairman (1989-1993). Prior to this Tom was an active player and had been one of the club’s most ardent supporters. Tom was also one of the three trustees of the club. He was a true gentleman and will be sadly missed. After the season in November long-time supporter Margaret Moorhouse sadly passed away & also 39-year-old Phil Tunney also lost a long battle against cancer. One of the biggest projects ever at the club was started in the winter of 2012 and completed just before the start of the season. The pavilion underwent its biggest alteration since it was built. The home & away & umpire’s changing room were all enlarged, with the addition of a girl’s changing room. The roof was completely replaced so that it now covers the entire pavilion and no longer a hotch-potch of different eras & styles. The pavilion was officially opened by MP Kris Hopkins on 28th April 2013 and was renamed in honour of the Club’s president Tom Barritt. Sadly Tom died shortly before the dedication. On the playing side the Club welcomed new recruits Andrew Foulds & Chris Baines from Upper Wharfedale…both going straight into our 1st XI side. Captained by Jon Best, our 1st XI recorded 2 centuries this season, with Andrew Foulds scoring both; and Chris Baines took 21 catches & 2 stumpings as 1st XI wicket keeper. Overseas player was Australian Ben Hillard, who scored 428 runs at an average on just over 20 runs/wicket & a top score of 90* not out. After some disappointing results Steeton won 2 of their final 3 matches to finish in 9th place in the league and secure 1st division status. Steeton were disappointed to lose in the 2nd round of the Waddilove cup to 2nd division opponents Thackley. with an average of 32.9 and top score of 84* Mark Taylor won the batting award. With 2 5-wicket hauls & a best return of 6-37 James Emmott narrowly beat Ross Suri to the bowling award. Steve Pearson was a worthy recipient of the fielding award with 13 catches. New 2nd XI captain Gary Boulton was the recipient of an unsettled side. The league form was inconsistent and with just 6 wins we finished mid-table 7th in the 1st division. A good Birtwhistle cup run was halted at the quarter-final stage by Guiseley.Our 2nd XI recorded 3 centuries Craig Walton scored 129 at North Leeds, Michael Wilson scored 108 v Olicanian & David Robinson scored 101* v Otley. but it was youngster Matt Price who secured the batting award. Paul Hardwick won the bowling award with 2 5-wicket hauls & a best of 6-43. Dominic Bennett won the fielding award. Our 3rd XI was captained officially by Chris Karakioakis, although youngster Luke Watson took much of the responsibility, guided by Mark Chapman. Steeton finished mid-table having won as many games as they lost. Any Chappell cup aspirations were short-lived as we lost at Guiseley in the first round. 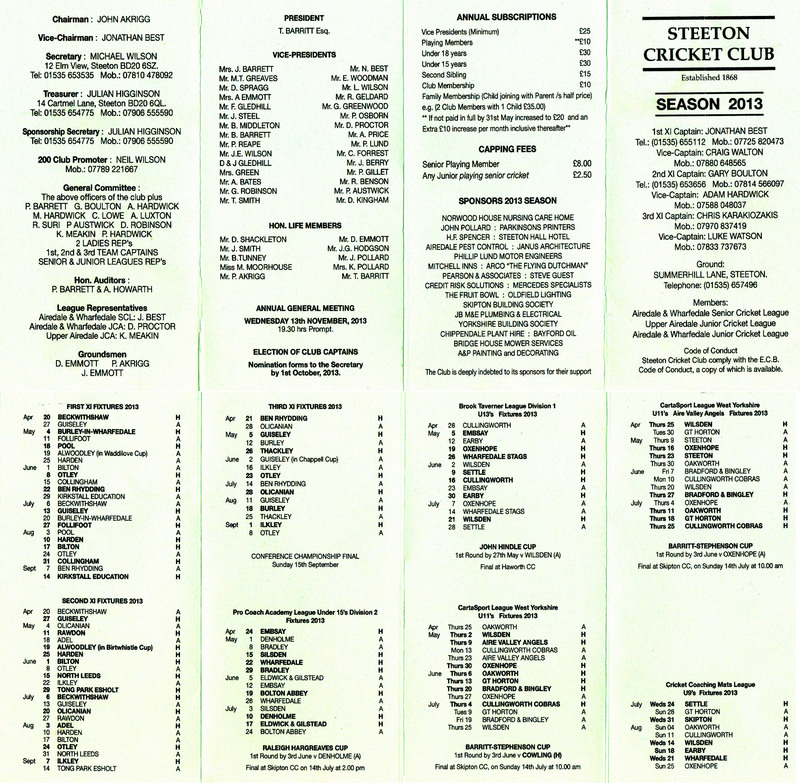 Steeton had 3 centuries scored: Lee Jackson scored 136 v Guiseley, Mark Chapman scored 110* in the same match against Guiseley & Matthew Price scored 103 at Guiseley. Lee Jackson & Mark Chapman set a new 2nd wicket Club record partnership of 201 runs at home against Guiseley. Chris Karakiozakis had a good all-round match at home against Ben Rhydding when he scored 80 runs and took 5-36. Matthew Price won the 3rd XI batting prize (to go with his 2nd XI batting award), and with a club record 33 wickets at 14.67 Charlotte Boulton was a worthy winner of the bowling award. Youngsters Ryan J. Birch & Aatif J. Modak shared the fielding award. The year ended with it’s 2nd ‘adult’ pantomime – a very enjoyable retelling of ‘Jack & his Beanstalk’ organised by Julian Higginson. Congratulations to all the participants.